The end weight I get when I change everything to the above numbers ls 85.35lbs. I'm not understanding of why this is happening. edit: so the difference between dough without a poolish and dough with a poolish is there's an extra 3.7lbs of water in the main dough. Is this to make up for the hydration being broken up between dough and poolish and the 75% main dough 25% poolish thing? And even if you are adding everything up to 100% your formula falls short. I took a stab at it. See if this looks correct, if not let me know what is off. The first sheet uses your weights for the polish. The second sheet calculates a 25% poolish. Boy, you hit us a right time. You've got a lot of great help working to help you out. This forum can not be beat! If you like it and want the spreadsheet, let me know. The formula works. You have calculated the poolish weight as 25% of the dough weight and this is incompatible because the formula works on total flour weight. 48% hydration is correct if you pre-fermenting 25% of the flour. In this case the poolish should be 12.5lbs flour, 12.5lbs water. Main dough flour would then be 37.5lbs. Our client specifically would like the poolish to be 25% of the total dough weight. 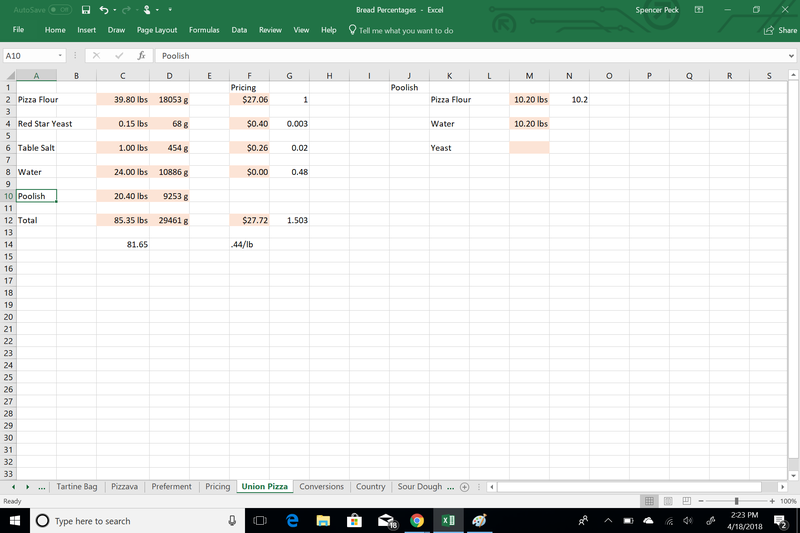 I assume I need to change my formula? Just subtract the weight of water and the weight of flour in the poolish from the original formula. Just make your poolish 10 and 10 and then your dough becomes 40 and 21.65. No need for spreadsheets. KA 325W 5 qt vs. 60 Hz 6qt? Croissants - in Buttery Heaven!